During the event period, useful items will be gifted to everyone who played Soulworker for the first time, and those who have played again after a long time. ・ Accounts that have played Soulworker for the first time. The following items will be gifted to accounts eligible for the event. The gifts are only given once per account. ・ Accounts that have not played Soulworker for at least 30 days. ・ Accounts that played Soulworker during the event period. 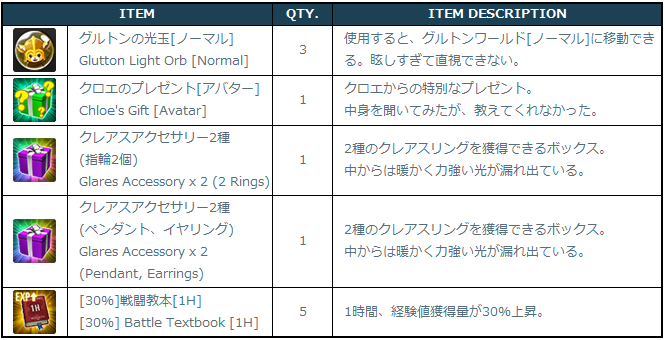 ・ Once the reward item/s are received in the account mail, it can no longer be received by your other characters. ・ This campaign will be on a per account basis. ・ Please abide by the rules when participating in the campaign. In the event that a fraudulent activity with the intention of obtaining the gifts and rewards that is against the Terms of Service is confirmed, the corresponding character will not receive the rewards. Furthermore, additional measures will be made against those players.